I have to admit that my excitement the week before departure was tinged with a small amount of apprehension. My knee was still playing up, with the daily two mile dog walk giving it grief on the downhill sections. I was constantly worrying about how it would react to a backpacking sack filled with enough food to last a week whilst walking across trackless, boggy tussocks. Well there is only one way to find out………. Travelling to the start of a backpack in your own vehicle provides an umbilical cord, a comfortable safety net. You can set your own schedule and carry spare clothes and food for when you emerge from the wilderness wet, hungry and stinking. Vehicles are not allowed on Rum without a permit and there is nowhere to drive anyway. It was therefore pointless hauling the Bongo up to the West Coast of Scotland to abandon it for a week. Instead countless single tickets were purchased for the train and Rich and myself left our fate in the hands of the British railway system. Leg one took us to Glasgow where we met up with Peter Edwards and we were treated to some fine hospitality at chez Edwards. 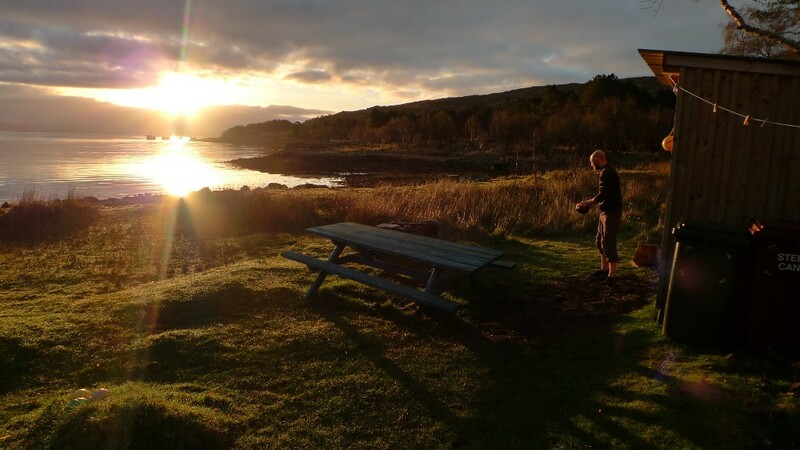 I have been following Pete’s fine blog for a while now and it was him that inspired me to visit the wonderful island of Jura a couple of years ago. Pete is getting married this weekend and the trip to Rum was sort of a stag do. Unusual in the fact that he had never met the pair of us, alcohol was lacking during the backpack and there was a severe absence of dancing girls on the island. Pete has done a brief preliminary post here. A train journey is never complete unless at some stage there is a ‘replacement bus service’, this involved a travel sickness inducing run up to Crianlarich. The twist and turns of the road alongside Loch Lomond nearly getting the better of me. 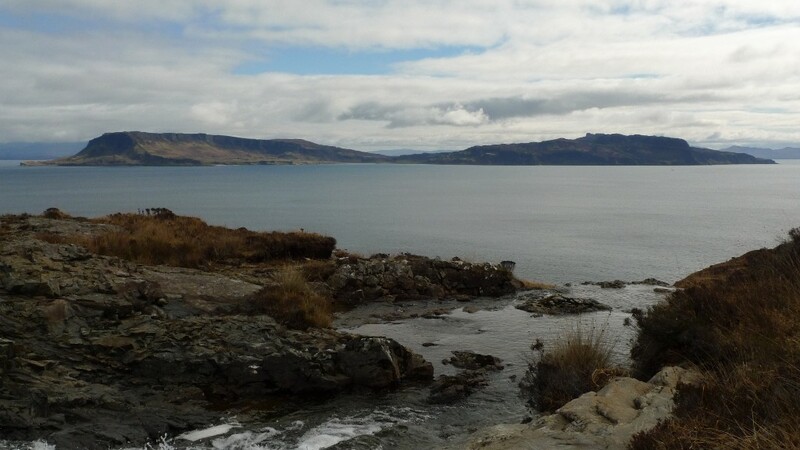 It was with some relief that we boarded the train to Mallaig. Not the prettiest of towns in the Highlands, that afternoon it did its best to resemble a Greek island, a calm sea glistening under a blue sky. It was a convivial atmosphere waiting whilst the ferry docked, the total number of passengers boarding numbering less than twenty. Thankfully the sea was like glass for the five hour crossing over to Rum, in bad weather the journey would be purgatory. We were the last stop after Eigg, Muck and Canna, the number of passengers dwindling at each island. It was simply stunning standing up on deck watching the islands come and go, the best part being an almost complete circumnavigation of Rum itself. We stood with binoculars tracing our route along the coast, picking out the bothies we would be staying in. Darkness was setting in when we finally disembarked with a handful of residents onto Rum. 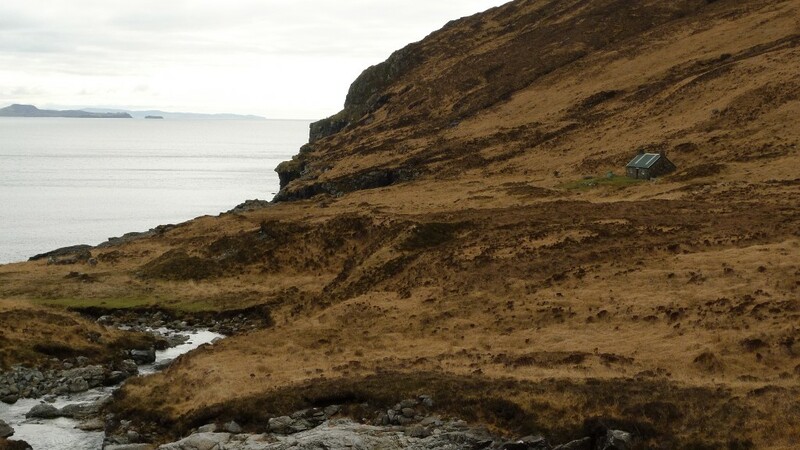 We were soon left alone as we walked along the shore side track towards the designated camping spot just outside of Kinloch, the only settlement on the island. 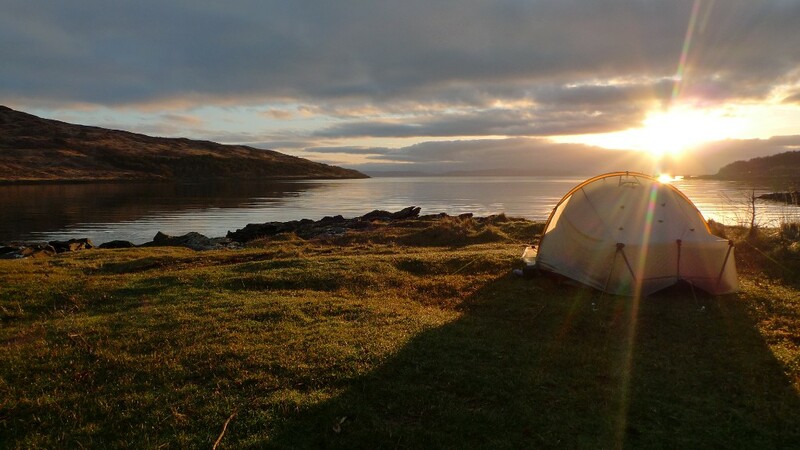 The word campsite is probably a bit too grand a term as there is in reality only a few spots where you can pitch a tent, most of the ground being rough and tussocky. There are however a couple of great wooden shelters where you can cook and fire pits with logs provided. 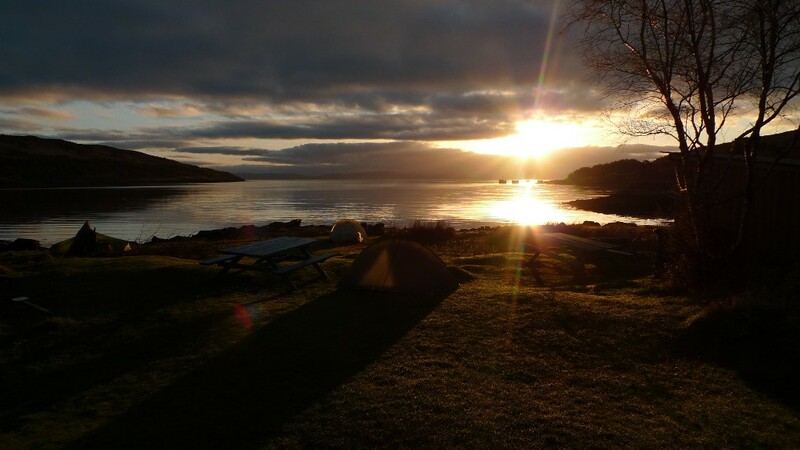 Best of all though is its location right on the shores of Loch Scresort. Tents were pitched by head torches and we then walked the few minutes to the castle with its bar and hostel. Clean clothes and spare food was left in the drying room before a convivial evening was spent in front of a roaring fire drinking Red Cuillin. I awoke to the sounds of Rich and Pete moving around camp and there was an orange glow in my tent. I stuck my head out just in time to witness a fabulous spectacle, the rising sun peeking through a gap in the clouds. Boots were hurriedly put on and a few minutes spent snapping away. What a splendid way to start the first day of a backpack. 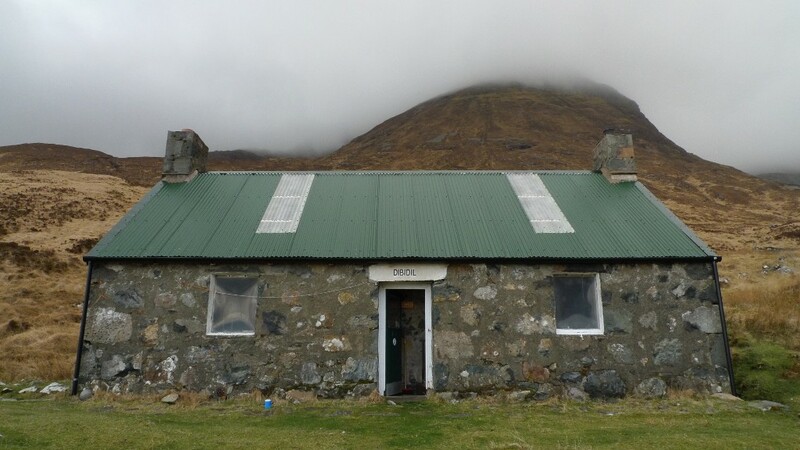 The plan for the day was to head along the coast to Dibidil bothy to spend the night. With the promise of good weather Pete was keen to do the Dibidil horseshoe, a demanding circuit of the Rum Cuillins. 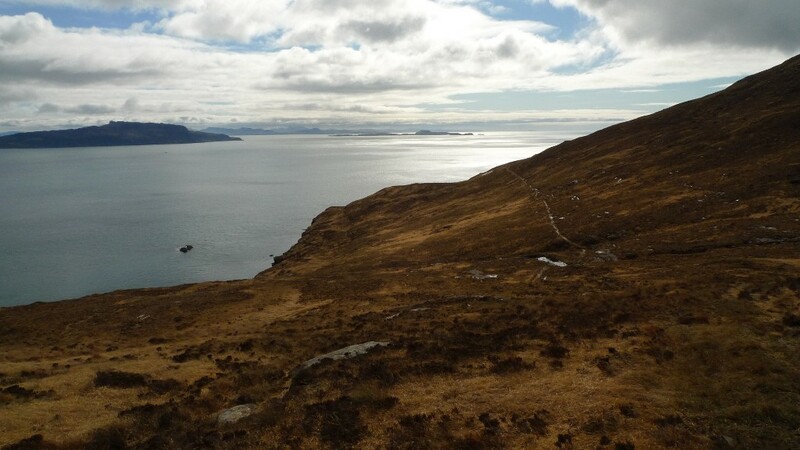 That involved walking to the bothy first, dumping gear and then setting off on the high and often exposed route. I had a sneaky suspicion that my knee would not be too happy with that so I decided that my day would only involve a stiff limp to the bothy. Pete and Rich were soon packed and on their way while I pottered around camp for a couple of hours taking in the fine location. It was whilst packing that I was mugged. A couple of hooligan hooded crows managed to steal my coffee and sugar bag when my back was turned. All packed and fully laden for five nights in the hills I located the old pony track to Dibidil and started the gentle ascent up to the 200 metres contour. The ground was wet and slippery and I took my time to ensure that I stayed on two feet, my knee stiff and complaining a little bit. The outlines of the Rum Cuillin ridge just popping up over the horizon. The path then contours the hillside, generally at around 200 metres. The seascape to the left is magnificent, a backdrop of the west coast with the Small Isle in the foreground. Most impressive of all were the Skye Cuillins looking all dark and pointy with the odd fleck of snow. 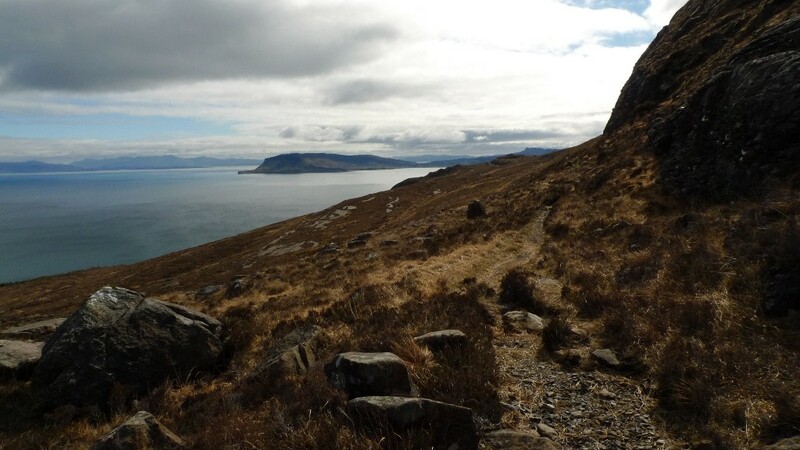 The Isle of Eigg was then to become the dominant feature of the rest of the day. The Rum Cuillin were soon visible in all their pointy glory. The path is generally fairly easy to follow although bogs and tussocks are doing their very best to take it over. 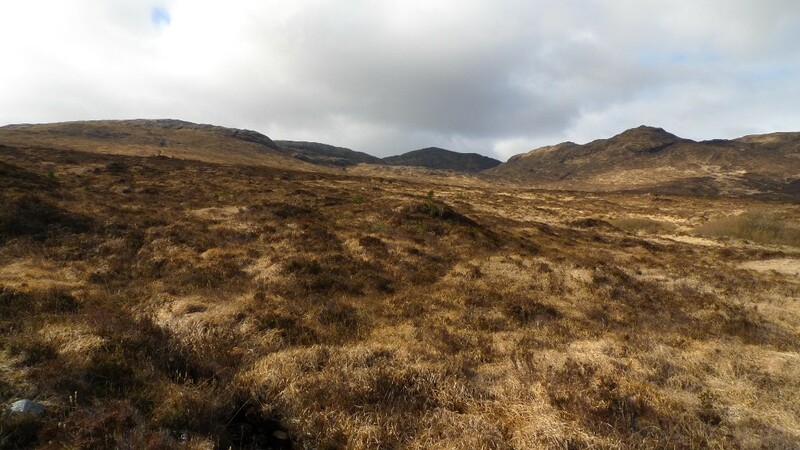 There was one section where I lost it all together for a few hundred metres, with deep bog grabbing at my boots. 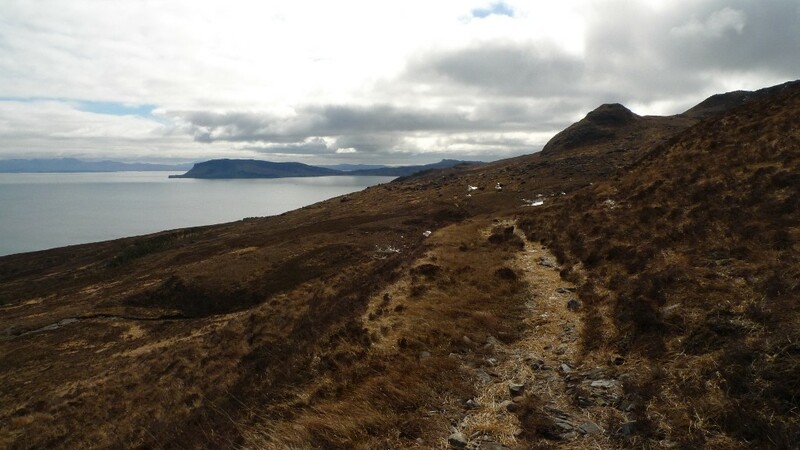 At the Allt nam Ba the path crossed the top of a waterfall, the curve of the valley framing the Isle of Eigg perfectly. I later read that a hiker lost his life here trying to cross the stream in spate, he slipped and was swept over the waterfall. Usually it is a benign stream and it just reinforces the dangers and power of even small amounts of water when it is moving quickly. The final section of path contours a steep section of hillside high above sea cliffs. A slip there would not be worth thinking about, whilst thinking about it I managed a minor trip on my Pacerpole but kept upright. A section of path that would need lots of care in snow or during high winds. 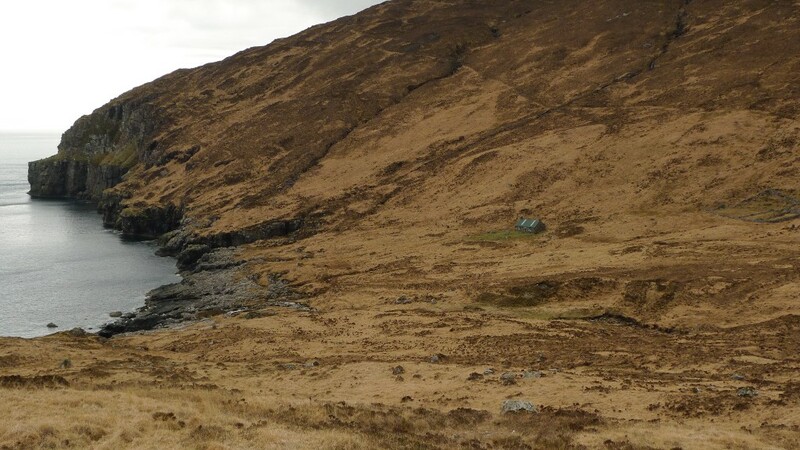 Then rounding the corner the bothy finally came into view, nestled into the rugged landscape. 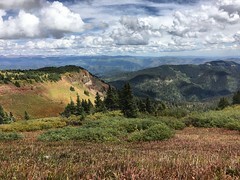 Suddenly there was a view to make the heart leap as I entered the foot of Glen Dibidil. The high corries of the Ainshval peaks were lined up in such a way that they had a good resemblance to the three sisters in Glencoe. 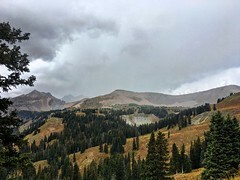 This really was mountain scenery at its finest. 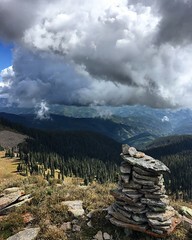 Unfortunately the highest peaks were swathed in cloud and I began to wonder how Pete and Rich were getting on navigating the narrow rocky ridges. Getting closer to the bothy I noticed a tent pitched outside. From a distance it looked like a laser comp and I hoped that it was Rich’s set out to air rather than because the bothy was full. 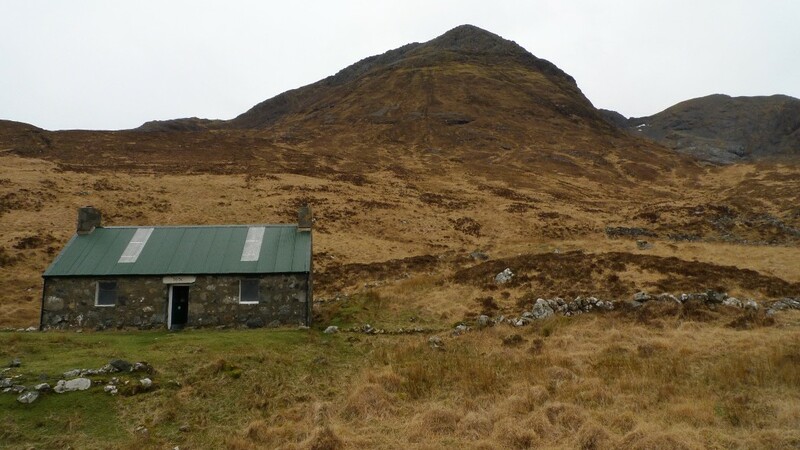 I always get a shiver of anticipation when approaching a bothy, what will it be like? will folk already be there? Approaching the door I noticed that it has been upgraded to hotel status, I opened the latch and stepped inside, my eyes struggling to adjust to the darkness. No one was at home and the only signs of life were Pete and Rich’s abandoned gear. I claimed the bottom bunk and set about unpacking and making a late lunch. I love spending time in remote bothies, there is an atmosphere about them that is hard to articulate. 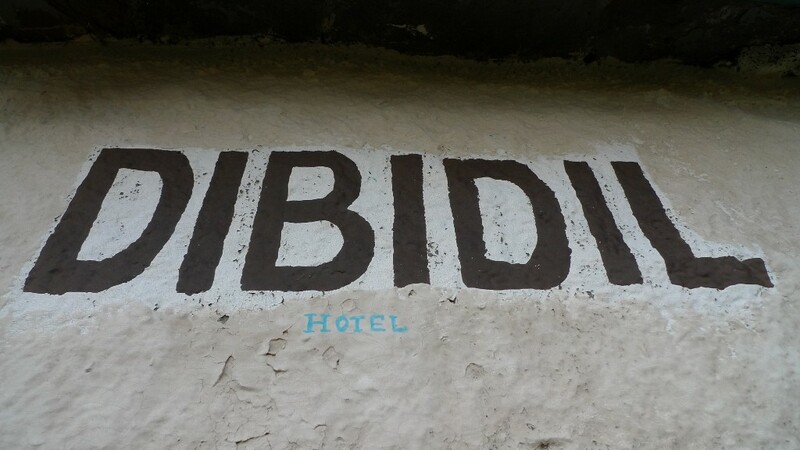 Dibidil is a fine specimen and well looked after, with none of the accrued rubbish left in the more accessible ones. I spent a couple of hours bimbling around, eating, reading the bothy book and wandering around the surrounding cropped grass in my comfy slippers. 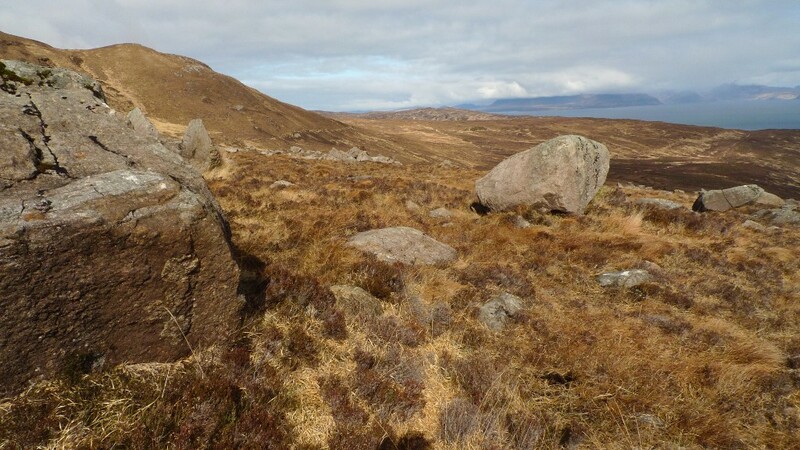 During a visit up the hill with the bothy spade I noticed that the area was a bit of a tick magnet, a few had to be brushed off my clothing and bare skin before becoming attached. I am hoping that the long bit of grass that tickled my nether regions did not have a predator laying in wait on it! As the afternoon drifted along curtains of mist and drizzle marched down the valley and I wondered how the boys were getting on up the hill. They finally appeared at around six, slightly damp after abandoning the horseshoe half way round. The navigation had got a bit tricky on some of the connecting ridges, plenty of scope to get onto difficult ground. The rest of the evening was spent relaxing in the bothy with a small fire going and relaxed chatter. The next day would be a real test for my knees as we would be traversing the wild pathless coast beyond Papadil. A fine and evocative post, James, brings it all back – seems like it was only yesterday or perhaps three months ago already. I feel like I’ve finally arrived now that I’ve got to appear in a Backpackingbongos write-up! Sliante! Nice one James. Looking forward to the next episode. 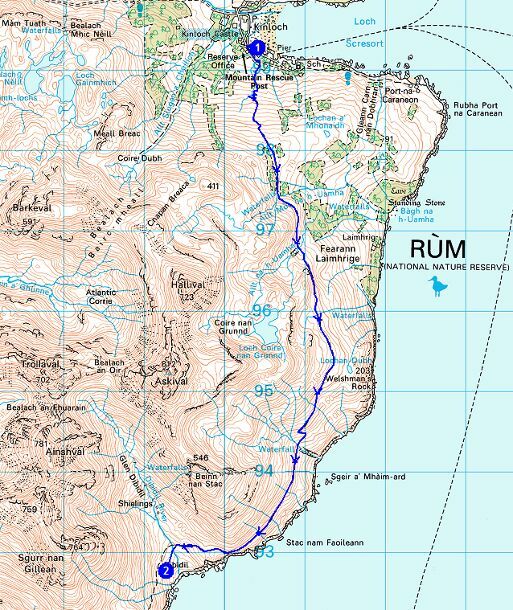 You do realise you have to go back to Rum for that airy stroll over the ridge, don’t you? An excellent post, you’re starting to make me think that my plans for the summer should change. 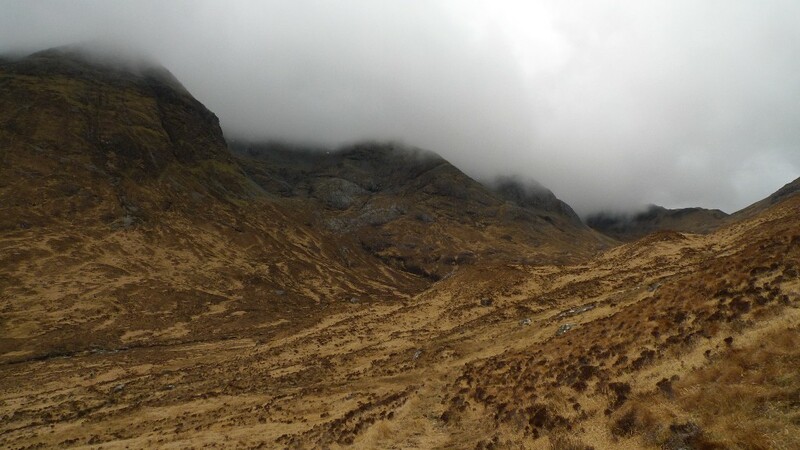 The location of the Dibidil bothy is sublime. Rum is definately on the cards now. On a related note, I’m a fan of that rather fetching picture of you on Pete’s blog, head gear and all. Oh, that looks tremendous, and what a brilliant pitch photo. It certainly looks wild and remote, just the thing for the backpacker. Hooded Crows – well it’s a change from the usual sheep!. Martin, obviously the whole reason why I left out that ridge was so that I have got an excuse to go again, possibly. Dave it is more than beautiful!! I will look up Coll Fraser as I think that visiting Scottish Islands is going to be my next big thing, they are simply out of this world. I am glad that I took it easy and I did not make the knees any worse. Charlie, go! Dibidil is a fine bothy but Guirdil is even better, there will be a big mention about it in some coming posts. Glad you liked the photo in Petes blog, that is my usual backpacking atire! Thanks Geoff, I think that you would love Rum, it is so wild and remote with no one around. Maybe just avoid in April and May when it gets a little busy. Unfortunately the west coast = ticks in large numbers, don’t go when the bracken is high as they then get everywhere………………..
Love the dawn photos and wildness of the landscape. Catching up with your travels James. Looking like a fantastic trip you had. Thanks Martin. That dawn was spectacular, well worth getting out of a warm sleeping bag for. I great trip it was. I stayed a week at Dibidil in 1974, together with a fellow member of the M.B.A., Iain McCreadie,6 months before I emigrated to Australia. 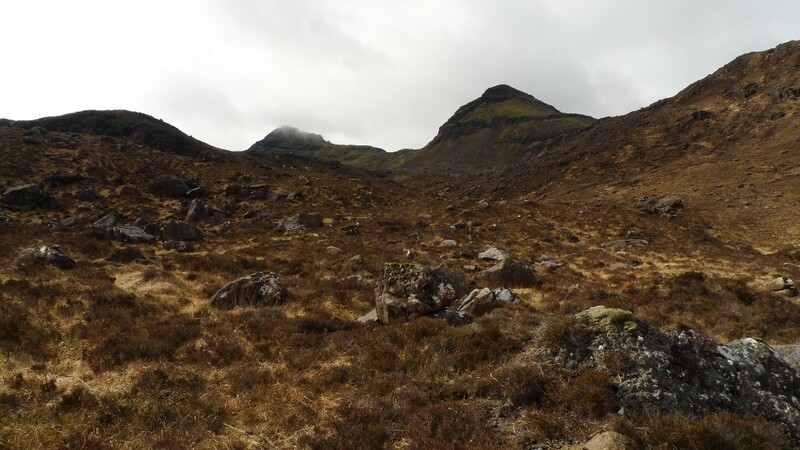 Loved the area and the bothy but, unfortunately, only managed half of the mountain circuit due to a wonky knee – Iain, however managed the whole lot. Interested to hear that the ticks are still around as I got badly bitten which resulted in a 12-day stay in hospital. In the late nineties I mentioned this to a dermatologist who insisted that I got tested for Lyme disease which was not identified until 1977. Fortunately the test was negative. So, beware the nasty bities!